Only official candidates declared with the registrar or who have made an official announcement are included above. Charlottesville Tomorrow is a non-partisan organization covering local elections. On November 8, 2011, voters in Charlottesville and Albemarle County went to the polls for municipal elections, and to participate in Commonwealth-wide races for the Virginia General Assembly. Political parties not holding a primary had to select their nominees sometime between June 25, 2011 and August 23, 2011. 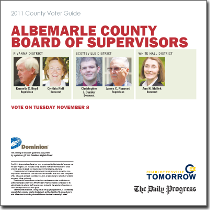 In Albemarle County, elections were for members of the Board of Supervisors and the Albemarle County School Board in three districts. County voters will also decide the at-large school board seat, sheriff, Commonwealth's Attorney, as well as a Director for the Thomas Jefferson Soil and Water Conservation District. Supervisors' races were held in the Rivanna, Scottsville and White Hall magisterial districts. On May 12, Republican incumbent Kenneth C. Boyd from the Rivanna district announced that he would run for re-election at a news conference. On June 15, Democrat Cynthia Neff announced that she would run against Boyd for the Rivanna seat. Lindsay Dorrier announced on March 23, 2011 that he would not seek another term as Supervisor from Scottsville District, creating an open seat. Christopher J. Dumler announced he would run as a Democrat to succeed Dorrier. On June 2, James C. Norwood announced that he would be running as a Republican for the seat. University of Virginia Doctoral Candidate Ned Gallaway was a candidate for the at-large seat. On May 25, Cindi Burket, a former substitute teacher, announced that she would also run for the at-large seat. From the Scottsville district, Steve Koleszar announced his bid for re-election on February 24, 2011. On May 19, Barbara Massie Mouly, the incumbent from White Hall, announced she will run for re-election. Denise Lunsford, incumbent Commonwealth Attorney, announced her run for re-election February 10 2011. Source: Virginia State Board of Elections. Charlottesville's general election will include races for three seats on City Council, four seats on the Charlottesville School Board, and Charlottesville Clerk of Court , as well as a Director for the Thomas Jefferson Soil and Water Conservation District. The seats occupied by David Brown, Holly Edwards, and Satyendra Huja were up for election. After a March 25 announcement Huja is the sole incumbent to seek re-election. In July of 2011, Paul Long told C-VILLE Weekly that he was collecting signatures to run as an independent. Long unsuccessfully ran as an independent in 2009. Four seats were available, including the incumbent seats of Kathleen M. Galvin, Colette E. Blount, and Llezelle A. Dugger and the vacant seat of former member Alvin Edwards, filled by Guian McKee. McKee contested the election for another term, and was the first candidate to announce his candidacy. On July 28th, local health coach Ivana Kadija announced her candidacy for the school board. On July 29th, Amy Laufer announced she would run for one of the four open seats on the Board. On August 4th, Jennifer McKeever announced her candidacy. Dugger won the democratic primary election. ↑ Web. HB 1507 full text, retrieved February 18, 2011. ↑ 2.0 2.1 Web. Some local campaigns on hold until state sets election calendar, Sean Tubbs, Charlottesville Tomorrow, February 11 2011, retrieved December 26, 2014. ↑ 3.0 3.1 Web. City Democrats Choose Firehouse Primary, Press Release, Charlottesville Democratic Committee, retrieved December 10, 2010. ↑ Web. Albemarle Supervisor Ken Boyd changes mind, declares candidacy, Brendan Fitzgerald, News Article, 12 May 2011, retrieved December 26, 2014. ↑ Web. Neff seeks to challenge Boyd for Albemarle Board of Supervisors, Frank Muraca & Brian Wheeler, Article, Charlottesville Tomorrow, 15 June 2011, retrieved December 26, 2014. ↑ Web. County's Dorrier won't seek re-election, Brandon Shulleeta, Daily Progress, World Media Enterprises, March 24, 2011, retrieved March 24, 2011. ↑ E-mail. . "*Media Advisory* Jim Norwood to Announce Scottsville BoS Run." Message to news@cvilletomorrow.org. 6 June 2011. ↑ Web. My County/City>Albemarle County, Virginia State Board of Elections, retrieved 29 Nov. 2011. ↑ Web. Ann Mallek announces re-election campaign for Albemarle Board of Supervisors, Brian Wheeler, Charlottesville Tomorrow, 13 Jan. 2011, retrieved December 26, 2014. ↑ Web. Battling Parkinson's, Dorrier winding down political career, Brandon Shulleeta, Daily Progress, World Media Enterprises, April 3, 2011, retrieved April 4, 2011. ↑ Web. Former Substitute Teacher is Albemarle School Board Candidate, 25 May 2011, retrieved 1 June 2011. ↑ Web. Mouly to run for re-election to Albemarle School Board, Sharon C. Fitzgerald, Article, 19 May 2011, retrieved 1 June 2011. ↑ Web. Lunsford officially announces re-election bid, TASHA KATES, Daily Progress, World Media Enterprises, February 10 2011, retrieved February 18 2011. ↑ Web. What Is On My Ballot, retrieved 16 September 2011. ↑ Web. November 2011 General Election Official Results, Virginia State Board of Elections, retrieved 21 Jan 2012. ↑ Web. 'Eight years is plenty', The Daily Progress, 21 April 2010, retrieved 6 June 2011. ↑ Web. First City Council Candidate Files Paperwork, 1070 WINA newsradio, Saga Communications, retrieved March 24, 2011. ↑ Web. Fenwick announces new campaign for city council, Sean Tubbs, Charlottesville Tomorrow, April 11, 2011, retrieved December 26, 2011. ↑ Web. Announcing My Candidacy, Brandon Collins, Brandon Collins, April 25, 2011, retrieved April 25, 2011. ↑ Web. Fry's Spring Resident to Run for City Council, 23 March 2011, retrieved 6 June 2011. ↑ Web. Andrew Williams Announced Candidacy for City Council Sunday, 29 May 2011, retrieved 6 June 2011. ↑ Web. Independent candidate Paul Long declares City Council ambitions, Chiara Canzi, Article, C-Ville Weekly, 22 July 2011, retrieved 25 July 2011. ↑ Web. Democrat Halfaday, James Halfaday, personal site, retrieved February 22, 2011. ↑ Web. Huja launches bid for second term on Charlottesville City Council, Sean Tubbs, site, Charlottesville Tomorrow, 25 March 2011, retrieved June 9, 2011. ↑ Web. McIntosh drops out of City Council race, Graham Moomaw, site, The Daily Progress, 16 June 2011, retrieved 16 June 2011. ↑ Web. Beyer announces campaign for Charlottesville City Council, Frank Muraca, site, Charlottesville Tomorrow, 9 June 2011, retrieved June 9, 2015. ↑ Web. Galvin enters race for Democratic nomination to Charlottesville City Council, Brian Wheeler, site, Charlottesville Tomorrow, 19 May 2011, retrieved June 9, 2015. ↑ Web. Smith announces bid for Charlottesville City Council, Frank Muraca & Brian Wheeler, site, Charlottesville Tomorrow, 13 June 2011, retrieved 15 June 2011. ↑ Web. Brevy Cannon launches campaign for Charlottesville City Council, Graham Moomaw, Article, The Daily Progress, 22 June 2011, retrieved 5 July 2011. ↑ 35.0 35.1 Web. Huja, Galvin, Smith get council nods, Graham Moomaw, The Daily Progress, 20 August 2011, retrieved 22 August 2011. ↑ Web. City could have its first Council in 30 years with no black members, Graham Moomaw, Daily Progress, World Media Enterprises, August 23, 2011, retrieved August 23, 2011. ↑ Web. 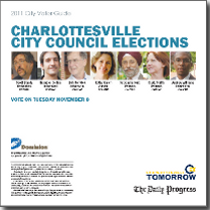 Democrats nominate Huja, Galvin and Smith for City Council, Sean Tubbs, News Article, Charlottesville Tomorrow, August 21, 2011, retrieved April 22, 2018. ↑ Web. Health activist running for city School Board, Graham Moomaw, Article, The Daily Progress, 28 July 2011, retrieved 5 August 2011. ↑ Web. Full-time mom, former teacher files for city School Board, Article, The Daily Progress, 29 July 2011, retrieved 5 August 2011. ↑ Web. McKeever Joins School Board Race, cvillenews.com, August 3, 2011, retrieved August 5, 2011. ↑ Web. Forum set for city clerk race, Daily Progress, World Media Enterprises, July 10, 2011, retrieved July 12, 2011. This page was last edited on 22 April 2018, at 12:27.